Pick as many TWP Stain Colors as you would like by placing a check next to each then click "Add to Cart". Color swatches at bottom of page. All samples cost $8 each to ship. Sample size volume is roughly 1.5-2 oz. It is not a full 1/4 pint can but enough to test a large area. Once you decide to purchase a stain from our site, you can use the money you spent on the sample(s) towards the purchase of a 5 Gallon Pail of Stain! Maximum $15 discount per customer. Instructions on how to get a credit will be included with your samples. *The 1500 Series has replaced the 500 Series. *Sample program cannot be combined with any promotional discount coupons! Enter your sample order number into the "Comment Area" during checkout. The sample credit will be issued after the order for the 5 gallon pail is placed. Typically the next business day and will post to your Credit card or Pay Pal account within 3-8 business days. Great way to try TWP colors before investing in a larger quantity! I have some outdoor teak furniture; a couple of wood stumps I use as stools and and long slab as a low table. Is the 1500 series safe on furniture? I like a color in between 103 and 120. Would you mix them 50/50 for me? We do not custom mix but you can mix them on you own. Do,you sell sample for twp 200? Can I get the 200 in the same colors as 1500 and 100? We do not have samples of the 200 Series and they do not come in the same colors as the 100 and 1500. I have a PT pine dock that is 4 years old now sitting in strong Florida sunshine and has never been treated. I like natural wood tones and don't want to cover it up. I also like the silvery grey dried wood look as it is typically less hot in the sun to walk on barefoot than darker wood tones. I am purchasing a sample of your honey tone, clear, and cape cod gray all in 100 for Florida. I intend to mix the grey with clear in varying amounts and make test samples. Is it safe to assume a 50/50 mix would be half as UV protective? Any words of wisdom for mixing? Yes, that is correct. It is possible to mix the TWP colors and any color you like will work. 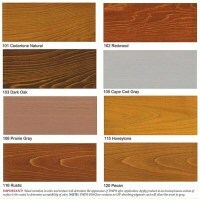 Is the Rustic Oak 116 the same color and formula as the old Rustic? Why did you change the name? The 116 is called Rustic or Rustic Oak. Same thing. 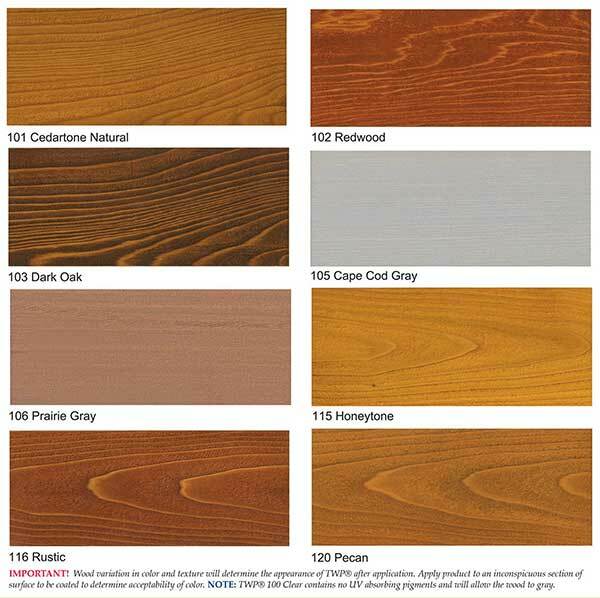 Is twp 100 cedartone 101 the same color stain as twp 100 cedartone natural. Cedartone Natural 101 and Cedartone 101 is the same thing. There is no Cedartone "100". Okay to apply 1515 in full sun, heat? Want to put it on rough sawn 4-board horse fence (1x6). New boards require only 1 coat for starters, correct? You can put on isn sun but be careful of days above 90 as it will dry faster. Rough sawn wood is very absorbent so you may need the two coats applied wet on wet. I have tried sample color pecan 1520 and 120 on some treated pine wood that was left over from the building of my new deck. In my state 120 is allowed and suggested by several individuals. My wife and I like the 1520 stain better because it is slightly darker. It this stain an acceptable stain for new wood or do you also suggest the 120 instead? 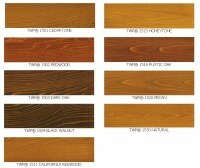 Could I use TWP 100 series wood & stain in Calgary Canada? What TWP series work best in Calgary Canada? I have one board on a new deck, made from treated pine, that is oozing pine sap. Can I still use a semitransparent stain on it when I stain the deck in 3 months? I plan to use Turpentine to clean the board at this time. Yes you can still stain it. The new TWP 1500 formula is designed to penetrate better, dry faster and outperform the previous TWP 500 series formula. 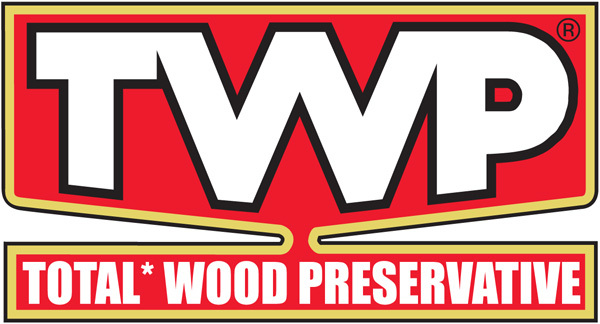 TWP 1500 Series is an EPA registered wood preservative which prevents structural damage and wood decay on exterior above ground wood surfaces such fencing, decking, wood siding, log homes, and roofing. TWP 1500 Series resists water absorption that causes warping, cracking and splitting as well as preventing freeze damage in colder climates. TWP 1500 Series is a low VOC preservative with special U.V. absorbing pigments that prevent unsightly wood graying, darkening and fading. The selected mildewcides inhibit the growth of mold and mildew which assist in preventing premature discoloration. TWP 1500 Stain Series will keep your wood beautiful, fresh and looking new longer. The ease of application and maintenance will allow you to enjoy your investment for years to come.